John Knodel has been with Methfessel & Werbel since 1987. 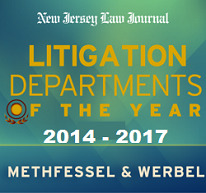 He has tried over 85 cases to conclusion before juries throughout New Jersey. John handles literally every type of personal injury claim including premises liability, automobile negligence, trucking negligence, failure to provide security, products liability, professional negligence, construction litigation, employment discrimination, environmental, as well as the defense of property damage claims, subrogation and coverage related issues. John is a member of the DRI, the NJ Defense Association, the Trial Attorneys of NJ, and the Essex County Bar Association. He is certified by the Supreme Court of NJ as a Certified Civil Trial Attorney. John is a court approved arbitrator as well.